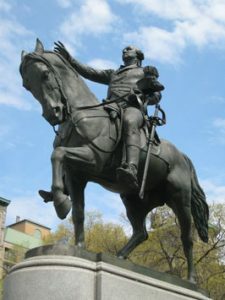 Hamilton & Washington | Custom & Private New York Tours, Inc. The Morris-Jumel Mansion, Manhattan’s oldest home, is a national treasure where Washington resided for a month after The Battle of Brooklyn (aka Battle of Long Island). Enter the dining room where Washington, Hamilton, Jefferson and “the Adams Family” held a celebratory dinner. Yes, Washington slept there! as did Aaron Burr, the archrival of Hamilton who killed him in a gun dual at the age of 47 in 1804. Hamilton’s home is beautifully restored with artifacts such as such magnificent French style furniture, Washington and Hamilton’s portraits as well. We’ll view Burr’s home on Commerce Street and stop by 82 Jane St. the home of John Bayard where Hamilton passed his final hours. We’ll visit Washington’s first inaugural site where the signing of the Bill of Rights and the British High Command all stationed at Federal Hall on Wall Street. Bend an elbow at Washington’s “watering hole,” Franuces Tavern, the oldest building in Manhattan (1711). Paul’s Chapel, the oldest church in Manhattan (1766) is where Washington prayed on inauguration day. Known as “The Little Church that Stood” it did not receive a scratch on 911. The graves of Hamilton, his son and wife are located on Broadway & Wall Street in the cemetery of Trinity Church. It’s the best way, I can think of, to see Hamilton on Broadway for free! Custom & Private™ New York Tours, Inc.